Trust unveils big-money plan to revamp Town Hall as it formally ends 45 years of council control. 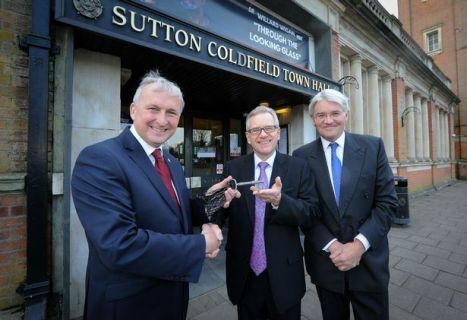 Royal Sutton Coldﬁeld Community Town Hall Trust was given the freehold to the central Sutton venue on Wednesday (April 3) by Birmingham City Council, with trust chair, Richard Mason, symbolically receiving the keys from city council leader, Ian Ward. The ceremony - at the town hall saw dignitaries watch around 25 youngsters from Sutton Coldﬁeld Musical Youth Theatre Company perform a fantastic Joseph and the Amazing Technicolor Dreamcoat medley, before the official handover saw the building passed back to Suttonians, after city council ownership since 1974. One of the main architects of the plan to save the town hall, Richard Mason, poignantly said: “A town isn't a town without a town hall." 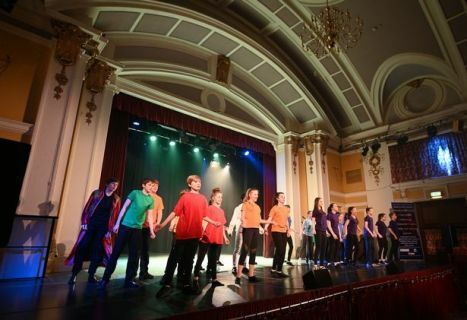 And it should not be forgotten that this venue was at risk - loss-making and crumbling, before Sutton Coldﬁeld Arts and Recreation Trust took over the management reins - which has led to the venue's ‘busiest year in the past 12 months since 1990’. 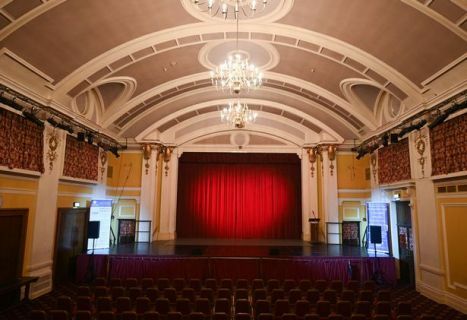 City leader, Cllr Ward, said the venue had ‘improved remarkably’ since he had last visited the town hall and was ‘delighted’ that the trust that took over running the building was now in a position to take on the freehold. He said: "It was a team effort with special thanks to Richard Mason." As he handed the key to the building over, he said: “To mark this historic occasion I have a key. We are in an age of austerity so it's not a golden key! I am not sure what it's a key to but it looks like a key to a dungeon!" But far from a cell - the building has now been ‘freed’ from local. authority control opening up a raft of grant opportunities. 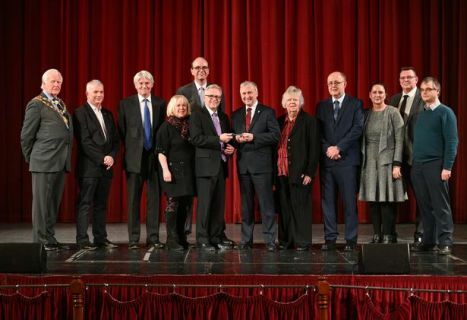 Andrew Mitchell MP had hotfooted it up from London, and away from votes on Brexit in Westminster, and said: “Today we see the completion of more than two years of negotiations and the transfer from the city council to the town hall trust. Local government ﬁnance is under very considerable constraint at the moment. Even if it was it is inconceivable that the city council could run a town hall like this. 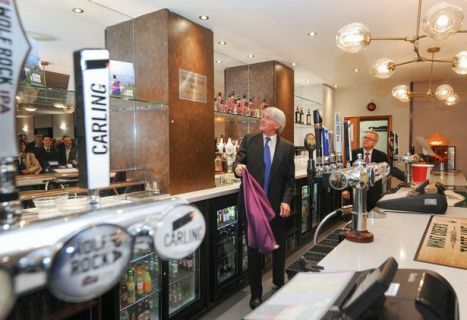 After the handover ceremony came a plaque unveiling in the Sir Doug Ellis Bar - with the former Aston Villa chairman honoured, for one of his last legacies before his death last year – a £200,000 grant to help refurbish the town hall, with £50,000 spent on the new bar. The new RSCCTI-IT board was announced Chairman Richard Mason, Claire Bridges, Russell Ludlam and Kevin Boyd. They have been joined by councillors Janet Cairns and Ewan Mackey representing Royal Sutton Coldﬁeld Town Council, plus David Pears, nominated by Birmingham City Council. In addition, Andrew Mitchell MP is the honorary president of the trust. ℗ First published in the Sutton Coldfield Observer, April 5th 2019.